India moved many steps closer towards becoming a digital economy with the launch of Unified Payment Interface (UPI). With this new payment method you’ll be able to send or receive money instantly. UPI is India’s most sophisticated public payments infrastructure in the world. The Unified Payment Interface (UPI) can be thought of like an email ID for your money. It will be an unique identifier that your bank uses to transfer money, this means that the online payments will become much easier without requiring a credit or debit card. The UPI interface will allow account holders across banks to send and receive money from their smartphones using just mobile phone number or virtual payments address without entering bank account details. UPI will simplify your online payments, with UPI you simply need to enter the details or scan qr code and ready to go, you can even send money to your family and friends instantly with just there phone number. UPI payments also offer detailed information on received payment (who paid & for what), apart from providing transaction management, reconciliation, insights etc. The security with UPI is fool-proof as the transaction will happen in a highly encrypted format. And the use of UPI will exponentially increase with the use of mobile phones. UPI is integrated with BHIM, Paytm, PhonePe, Tez, etc and these apps work very well. However most of the banks have come up with their own UPI app now like SBI Pay, HDFC Mobile Banking, ICICI Pockets, Axis Pay UPI App, Union Bank UPI App, United UPI, Canara Bank UPI – eMpower, Andhra Bank ONE – UPI App, Bank of Maharashtra – Maha UPI, etc. UPI is a great step in right direction and it is set to become an efficient alternative to cashless payments with faster, easier and smoother transcations for millions of people in India, eventually rendering credit cards redundant for online payments which will benefit both buyers and sellers. At InstaCrypto we are integrating UPI to make it easy for our registered users to transact with us and use our service for no cost of funds transfers and complete their online request instantaneously. 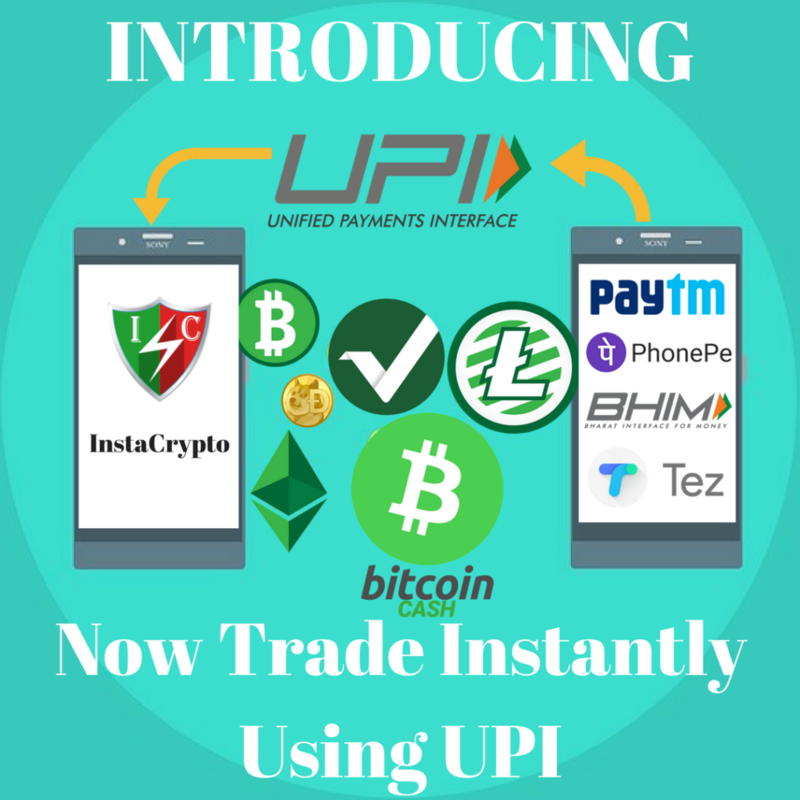 As the main aim of instacrypto is to facilitate instant crypto trade, integrating UPI has made it one step easier and faster for us to fulfill just that. This entry was posted in UPI. Bookmark the permalink.